I love Erie Street Cemetery. It's a beautiful little bit of greenspace in the middle of downtown Cleveland. It is located between East 9th and East 14th Streets. 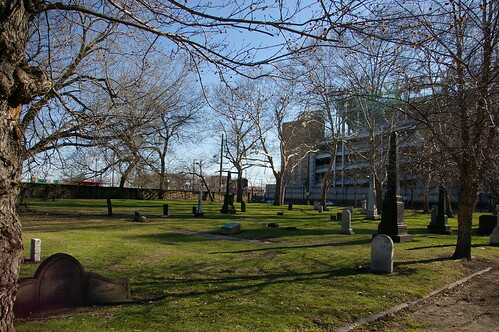 The cemetery was founded in 1826 as the first permanent burying ground. It replaced a site just south of Public Square - Ontario Street Cemetery. Several graves were moved here in 1826 from Ontario Street Cemetery. A historical marker, erected by the Early Settlers Association, identifies the graves that were moved. The stones have been placed flat on the ground. 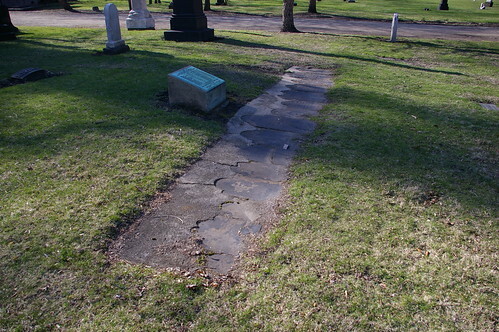 One of the graves moved from the Ontario Street Cemetery is that of Deming Brainerd. Two other are William Prout and Amy Lewis. Another marker identifies the burial site of others, unknown, moved here from the Ontario Street Cemetery. The burial site of Joc-O-Sot, or Walking Bear is marked with this stone, which has a plaque on the reverse side. 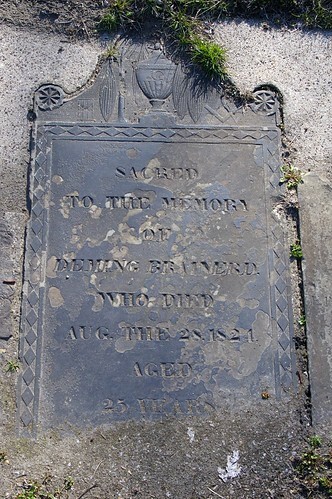 That marker was made to replace this, the original grave marker, which fell victim to vandalism. It lists the date of his death incorrectly. The correct date is September 3, 1844. 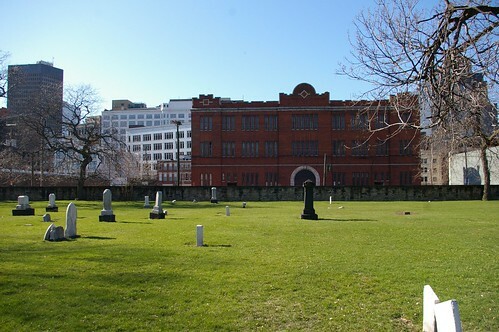 The cemetery contains the graves of Lorenzo and Rebecca Carter, the first permenant European Amercian settlers to the city of Cleveland. The Early Settlers Association erected a marker commemorating their lives. 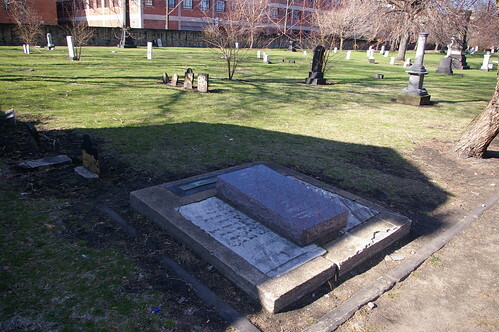 The Erie Street Cemetery is a vital piece of Cleveland history. 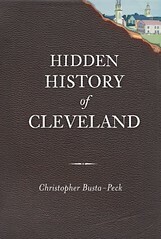 It remains the earliest surviving piece of historical fabric in downtown Cleveland. At the same time, it is a nice place to take a lunch break or spend a few minutes before a baseball game. 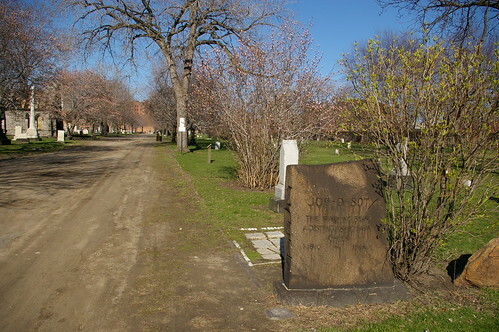 The Ontario Street Cemetery, from what I have read, appears to have been located at the intersection of present-day Ontario and Prospect Avenues. I am not sure which corner of the street. Would you happen to know this information? Thanks for the great article! Denise: Beautiful and informative...thank you! I went on a tour of the Erie Street Cemetery last night, and the last word I would use to describe it is "love." Did you know that there are approximately 18,000 bodies buried there? Those markers - the few that have survived vandalism and erosion - are irrelevant when there are remains under your feet wherever you step. In those days it was basically a dumping ground, a pit for bodies. People did not want to end up there, especially Joc-O-Sot. No wonder the Cleveland sports franchise hasn't won a championship when a sports team called "The Indians" mocks his people right across the street from his eternal resting place, a place he never wanted to stay. 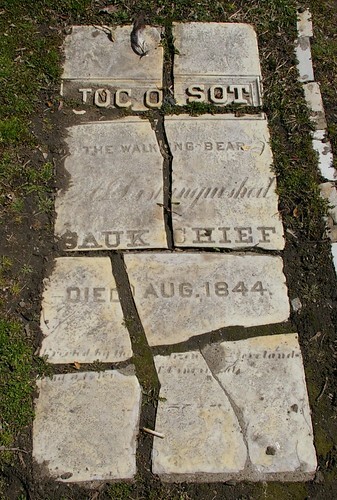 Legend says that those cracks in Joc-O-Sot's original grave marker cracked from his own rage. I can definitely appreciate the place for it's historical value as the oldest landmark in the city of Cleveland, as I am a Clevelander myself, but it's true to it's name and is definitely eerie, not beautiful. There have been murders there, hangings, rapes, you name it. Have you noticed that there's not a single bench in the entire cemetery? The city does not want you there, and, in fact, has wanted to get rid of it several times. But could you imagine anything built on top of 18,000 bodies? Probably not the best idea (think Poltergeist). So, think about that next time you take a lunch break there or go before a ball game. Just trying to set the record straight. R.I.P. my fourth great-grandmother, Sarah Morey Pratt and her grandson John Morey Pratt. I searched for your markers without success in Section 4, Lot 71, Grave 3. Love, Anne W. E.